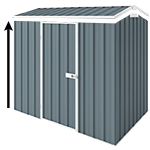 This 2.26m x 3m x 2m single door colorbond shed is very popular as it suits most Aussie backyards and has a very attractive price tag. You can choose from 4 different colors - Classic Cream, Pale Eucalypt, Paperbark, and Woodland Grey. A very well made shed. Easy to assemble. The customer service is exceptional.